A superb performance from start to finish. As the WFDF 2018 World Ultimate Club Championships drew closer to the final game, it had already been quite the week, featuring everything from scorching heat to shocking skies. 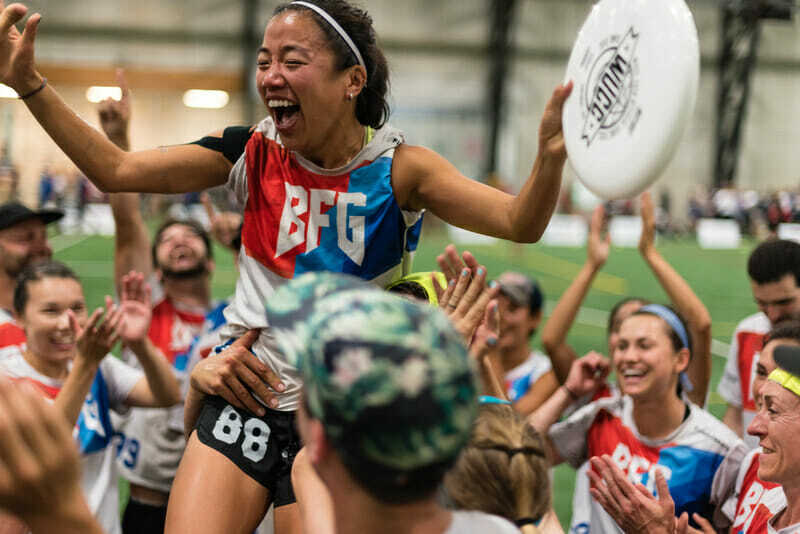 Yet there remained one last encounter before the sun could set on the tournament: Boston’s Slow White took on Seattle’s BFG in the Mixed Division final. Neither team was openly lauded as a favorite coming in. Yet, due to Slow White felling Mixtape in their quarterfinal and BFG besting AMP on Friday, the final stretch at Worlds would be contested exclusively by darkhorses. It was a spirited affair as BFG’s deep game collided with the fast but never frantic flow of Slow White. In the end, Seattle would stand as World Champion, besting the Boston side 15-11. Comparatively, BFG are a team still in its relative infancy, having emerged with intent on the national stage in 2016. Since then, they have grown together as a family, becoming better players, and better people, in the process. The match started with both sides staying true to their styles. BFG began on offense, running into an immediate junk defense designed to shut down their pull play. In response, Kerry Chang and Crystal Koo dumped and swung, allowing their downfield cutters to readjust before Kieran Kelly swept back under — something that would become a trend — and launched a perfect huck to Rena Kawabata for the opening score. Slow White answered with their patented flow, ending with Alex Trahey evening the score. A roar went up from the crowd. Clearly WUCC was not going to go gently into the good night. On the next point, Slow White was able to get a turn as Jeff Pape rushed a throw to the endzone, in no small way influenced by Chris Waite’s stifling point-long marking. Waite cashed in this opportunity via a beautiful pitch length huck to Lexi Zalk. As if the crowd needed more incentive to cheer, Walker Hatchett’s subsequent pull would squeeze through two of the gaps in the ceiling’s support structure before reaching the awaiting BFG O-line. True to form, BFG tied the game with a magnificent huck from Bryson Simon Fox to Kelly. On the next point, BFG earned their break back as Andrew Hagen soared and stole away an attempted hammer to the endzone. BFG’s offense seemed to be reacting quicker to their indoor surroundings. Mario O’Brien sliced through Slow with a sharp blade flick and Sam Pickel busted out a championship scoober. They were also utilizing the deafening crowd to confuse Slow’s defense as their switches couldn’t hear each other and struggled to react appropriately to Pickel and O’Brien’s handler movement. Slow White regained their composure, led by Jeff Smith, Caitlin Go, Tannor Johnson, and Vicki Chang weaving their way to the endzone before Trahey scored his second point to make it 3-3. BFG returned fire via Alexa Kirkland, who linked up repeatedly with Kerry Chang for yards, with the latter showing excellent endzone movement to free himself up for the score. The teams traded a pair, then an offhand misthrow from Jeff Smith would give BFG a chance at another break. Captain Tommy Li, flanked by Pickel and Andrea Coleman, were determined to take it, recycling the disc with patient aggression until Leah Bar-On Simmons was able to secure the point, 6-4 to BFG. Unusual, perhaps, that the D-line is more conservative than the O, but BFG wasn’t conceived with the intention of being conventional. BFG ratcheted up the defensive pressure, making separation an increasingly difficult thing for Slow White cutters to attain. It was challenging but not inescapable for Slow White, as evidenced by Johnson’s phenomenal break flick assist to Tommy Ferguson. They held, but it was apparent the gaps their quick offense thrives on exploiting were starting to shrink. The teams traded flawless hucks to make it 7-6 before Kieran “halfway through playing the game of my life” Kelly lasered a flick to Bryson Simon Fox for half. Coming out on offense in the second half, it was clear Slow White had noticed the lack of sky above their heads. Ferguson sent an ideal indoor blade flick to Johnson for the hold. Defensively, the switches were gone, as the team instead turned to a hard matchup approach. It was not too effective initially, as BFG swept down the field led as ever by Koo, Pape and Adam Simon’s impeccable throws and movement. Afterwards, Waite could be heard telling his D-line to “bait the handler swing for a D,” as they tried to find a way to counter BFG’s ever-increasing confidence. The teams traded turns on the next point, showing how the intensity of the match was only increasing. Slow White coughed it up on a rushed red zone pop and BFG with an overthrown huck — both sides were living and dying by their weapons of choice. On the second try, Slow moved effortlessly down the breakside ending with Go curving a beautiful flick to Zalk. Slow White kept attacking the break side with great throws. They were eager to get their defense back on the pitch now that it had seemed to somewhat have come to grips with BFG. Johnson finished the move with a short shot to Go to make it 10-9. Slow White’s D came out on fire, sticking on the shoulders of each of their players, forcing a rare under cut layout from Kelly to save possession for BFG. He quickly got up and popped it to Kirkland, who threw a magnificent inside break backhand to Kawabata, who finished the play with a flick break to Lindsay Simon Fox. The next point showed the unreliable nature of the indoor turf, as both Ferguson and Coleman slipped and had to call injury. Once more Slow White percolated their way down the pitch before throwing it away on an end zone miscommunication. Perhaps an indictment on the limited training they’ve had together this season is that unwanted frantic edge re-entering their play due to BFG’s pressure. O’Brien wasted no time sending a low, fast flick huck to the streaking Li. Showing off some football feet, Li tiptoed the sideline at pace for the break, pushing their lead out to 12-9. Slow White took a timeout to recuperate then hit back with a rare huck. Trahey set up Johnson to impress the crowd with a leaping sky over the BFG defense. Slow White then came out with some of the highest intensity coverage of their tournament. Between the defensive pressure and lack of ventilation, BFG were struggling to breathe. Despite that, Pape was able to make several high stall, high stakes reset cuts, running the dump swing until eventually someone became free downfield. He was rewarded for his life-saving movement with a point when Simon hit him with a lightning-quick flick break throw to put BFG up 13-10. Time was starting to run out for Slow White, though they kept their composure. Zalk, Trahey, and Rosalyn Año ensured they stayed true to their well established style, meandering their way towards the endzone to get their D-line back out there. Tired as they were, Slow looked far from done, and even further from it when Simon overthrew a huck to the endzone. Hope sprang momentarily anew for the Bostonians but it was not to be as Kieran “almost finished playing the game of my life” Kelly got a monstrous layout D that was so clean you could have done surgery with it. Great dump resetting allowed BFG to settle themselves again. Once the disc had been swung a few times, Kerry Chang sent a perfectly weighted leading pass to Kelly for the bookends, 14-11. BFG came out on the last point with murderous intention. All their defenders forcing Slow White under, daring the Bostonians to try outwork them now that they could taste the gold. Eventually this would earn them a turn on an overthrown reset. BFG wasn’t going to wait any longer for their medals. Hagen sent a lovely half pitch leading pass to set up Li on the endzone line, who popped it to Linnea Soo for the score and world title. As great as their defense had been, one couldn’t help but point to the number of redzone turns Slow White had. Several times, they used their quick movement to slalom down the pitch before crashing into BFG’s endzone defense and rushing themselves into a turnover. Not the fairytale ending they wanted, but silver at WUCC and spending a week with old friends in the (mostly) sunshine, is about as good a conclusion a team can ask for. As for BFG, they had danced their way to the top of the mountain, though questions still remained about the ranges on the horizon. Gu said, “On to the season, I think while this feels like this great thing that we did, and we’re going to celebrate this thing we accomplished together, what is overwhelming me right now is the feeling of like, this great thing that we’ve become, this team, and we’re going to continue being this team and growing, and loving and experiencing joy together. Though Club Worlds has ended, the season has not. Everyone can enjoy a well-earned reprieve, but only a momentary one. The great disc keeps spinning, and there’s still plenty left to chase down this year. Comments on "In Just Their Third Season, BFG Captures A World Title"